Native Remedies Candidate is a natural formula that helps eliminate excessive Candida overgrowth. Formulated using selection of herbs, this remedy promotes the growth of healthy probiotic flora in the digestive tract to improve overall health. This non-addictive natural herbal remedy also reduces sugar cravings related to Candida overgrowth. Along with this, it also helps reducing systemic yeast infections and increasing vitality and energy levels. What is Candida and how does it affect you? Candida is a microorganism in the category of yeast and fungi. It usually lives in the digestive system and on body surface in small amounts. When under certain circumstances its number increases, it breakdown the walls and enters bloodstream to invade into tissues and organs where it doesn’t belong. This causes many different health problems like yeast infections, digestive problems, skin and nail infections. What Native Remedies Candidate does? It is a natural herbal remedy that has been formulated for naturally reducing Candida overgrowth. The all natural formulation helps eliminate fungal overgrowth at its source to stop topical Candida infections. Selected ingredients in the remedy promote the growth of healthy probiotic flora in the digestive tract to repair cell damage and strengthen overall systemic health. Pau d'arco is an herb that supports antioxidant activation and maintains healthy levels of flora in the body. Lapachol and Beta-lapachone in this herb are known for their anti-fungal properties. Marigold is an herb with strong anti-fungal and anti-inflammatory properties. It has been used in ancient Greek, Roman, Arabic, and Indian cultures for supporting healthy detoxification. Lemon grass helps maintain systemic health and promote healthy and balanced levels of flora in the body. Clinical studies have found that it stimulates cell regeneration and treat intestinal infections. The anti-bacterial and anti-fungal properties of this herb make it ideal for repairing intestinal walls that have been damaged by Candida overgrowth. You need to dilute the drops in 1/4 cup of water or juice and take it after meals. For optimal results take 0.50 mL 3 times daily for 6 weeks. Note: The dosage information is for adults and children above 12 years of age. 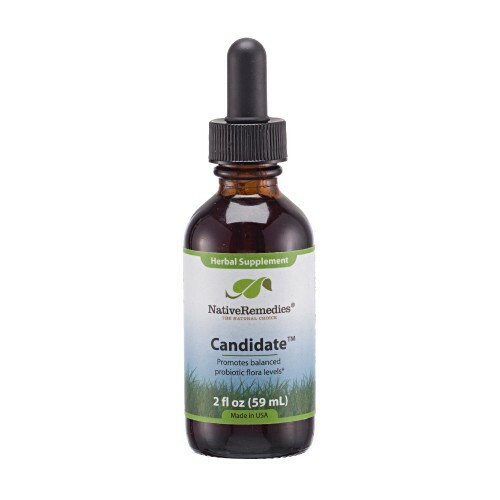 Ingredients in the Candidate immediately get to work and eliminate Candida from the intestinal tract to promote intestinal health. Normally, it takes around 3 to 6 weeks to eliminate excessive Candida overgrowth. However, the response time varies for every individual. For best results, use the product consistently and eliminate sugars, alcohol and refined carbohydrates from your diet. Candidate is formulated using 100% natural ingredients and is completely safe for use. If you are pregnant or are breastfeeding then consult your doctor before starting the course. Place your order for Native Remedies Candidate with SkinCareTotal before 4 pm on any working day and get it delivered at your doorstep the very next day. Just click on the ‘Add to Basket’ option to get started.